The previous article in this series covered implementing an Arduino device as the remote app that send the UI configuration at start up to the UWP app so that the UWP app can configure the UI for it as an array of buttons. The Arduino device executes a state machine. 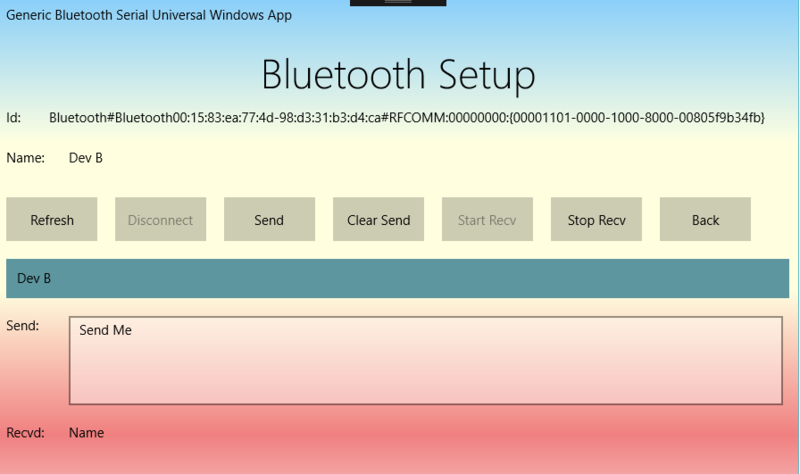 The article covers the BT connectivity from within the UWP app and the implementation of the UWP apps mirror of the state machine. It uses BluetoothSerialTerminal.xaml XAML page and its codebehind page BluetoothSerialTerminal.xaml.cs form the IoTCoreMenu project within that repository project. When this page loads it lists the available BT device-services in the blue menu in the middle. In this case Dev B from the HC-05, the Arduino Shield.is listed. Normally there will be only be one device.service.If none then check that the device is paired. You double click on it and its Id gets listed above and your good to go. You then click on [Back] which returns you to the UI Menu (Main) page. You can return to this page and press [Stop Recv] to disconnect then reconnect. This gets the list of available BT Serial devices. You have to query RfcommDeviceService to get the list. 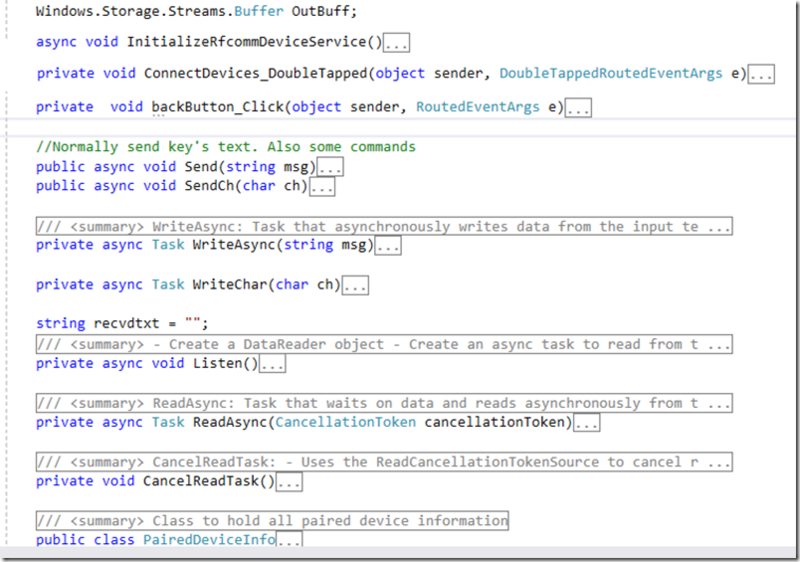 Then gets the selected device-service and passes it to ConnectDevice_Click(). DeviceInformation DeviceInfo = ((PairedDeviceInfo)ConnectDevices.SelectedItem).DeviceInfo;// await DeviceInformation. The _socket is what is used (as streams) to send and receive data over BT Serial.